South Korea’s presidential office on Tuesday played down a new report on North Korea’s “undisclosed” missile sites. South Korea’s government said that it’s going too far to call the North’s continued activity a “great deception” given that it has no specific agreement to dismantle or disclose the facilities mentioned in the report issued by Beyond Parallel, a group at the Center for Strategic and International Studies. 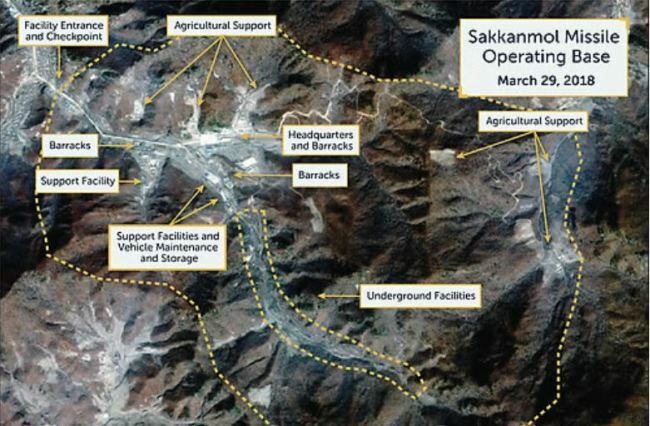 It focused on the Sakkanmol missile base for short-range ballistic missiles, presenting a set of related commercial satellite photos taken in March. The base in the Tactical Belt in North Hwanghae Province is located 85 km north of the Demilitarized Zone and 135 km northwest of Seoul. “The intelligence authorities of South Korea and the US have far more detailed information from military satellites and are closely monitoring (it),” Kim said. He said the facilities have nothing to do with intercontinental ballistic missiles or intermediate-range ballistic missiles. In June summit talks with President Donald Trump in Singapore, the North’s leader reportedly agreed to dismantle the Sohae satellite launch facility near the border with China, also known as the Dongchang-ri missile base. The CSIS report said the future of the long-range missile base, while gaining much media attention, obscures the military threat to US forces and South Korea from Sakkanmol and other undeclared ballistic missile bases. It came amid lingering doubts about whether the North will submit a full list of its nuclear and missile programs and engage in serious denuclearization talks in spite of Trump’s all optimistic statements, including the talk of his good relationship with Kim. The report is a reminder that there’s still a long way to go to eliminate the North’s major weapons program. Park Won-gon, an international relations professor at Handong Global University, said the US government seems to have leaked the information deliberately to the CSIS in order to put more pressure on Pyongyang. “It implies a message that ‘We know all the missile facilities in North Korea. So, it’s useless to conceal them or delay a declaration,'” he said. He also pointed out that the North has just declared a halt to its nuclear and missile tests, not the suspension of the operation of those existing facilities and a development program itself.